Q. Please bring back extended opening hours in St Mary's! Thanks for your feedback. I'm glad to hear that you found last semester's trial helpful. 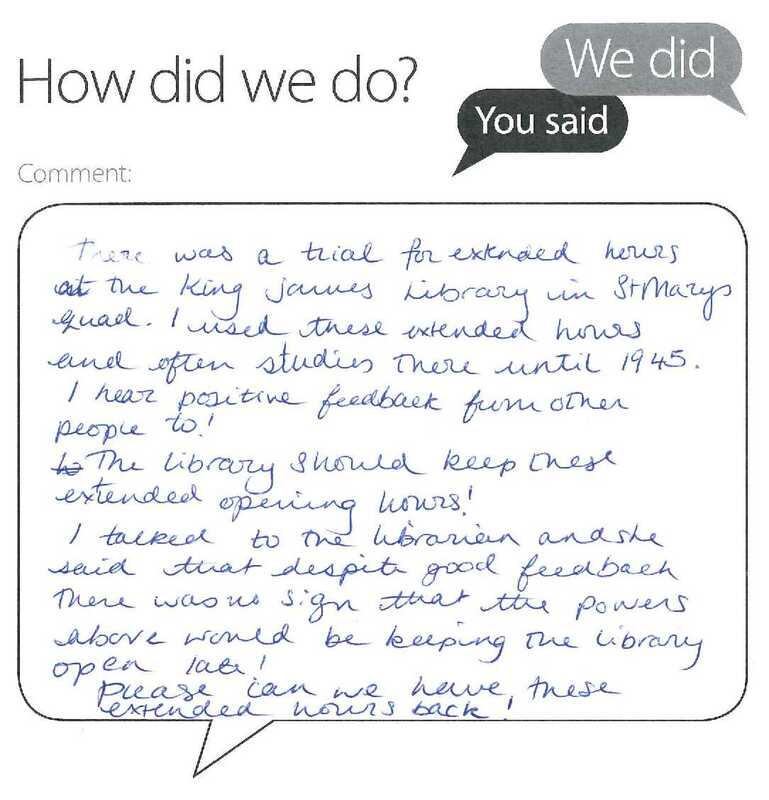 Part of the reason for the trial was to see firstly how popular it was and secondly what it took for us to staff it. We managed to deliver this with no significant increase in staffing costs but it did put too much strain on our cover at the Main Library, from where we were taking staff to keep St Mary's open. Therefore the only way we can continue with these hours is to pay for additional staff cover and this is not something we have a budget for this year. Budgets for the Library's operating requirements are set well in advance and we are in fact about to submit our unit plan for the forthcoming year. In that plan, I will be making a request for the necessary increase in budget so that we can offer these extended hours at St Mary's on a permanent basis from September. The evidence we gathered from head counts last semester and feedback such as your own, helps us to make this argument for further investment which we shall hopefully secure.